Recently the newest update of WooCommerce was released. Let’s look at what you can expect to find. Previous to this release, you needed to add the plugin WooCommerce Blocks. With 3.6, they are part of core to make it easy for you to insert any product into a post or a page. Now you are not just limited to the product archive pages. When used wisely, this can come in handy for content based around specific products, giving more flexibility to smaller shops. This has been a favorite for archive pages and on homepages of themes like Storefront, but categories are such an easy way to group your products and now display them on pages and posts. This one is very useful for showing a single product or a group of products specifically. Again, the theme Storefront lets you pick up something similar to this on the homepage, but now you can list these on any post or page. They are automatically pulled in based on your sales. You can also filter them by categories. Again, pulling in your most recent added products and allowing you to filter them by category. Similar to the last two blocks, but only for products on sale. Based on reviews that include ratings. You can also pull in products based on attributes if you are using variable products or some other aspect that uses attributes. And lastly, the good old Featured products. What’s nice about this block is the product does not have to be set as a featured product in the WooCommerce settings. And it also doesn’t automatically tag the product as a featured product when you use this. And since this is a pretty slick format, here is what the featured product looks like when we add it to the block with the options. You will also find a new Marketplace Suggestions. 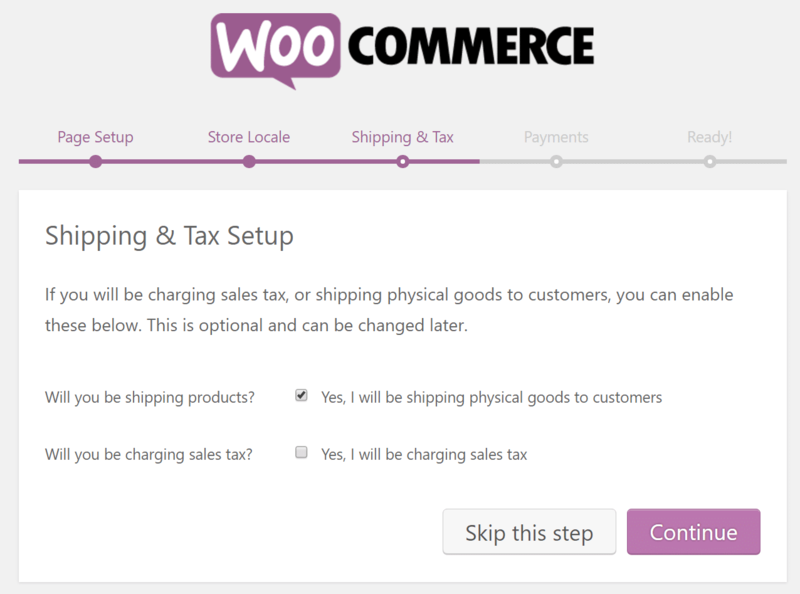 For those who don’t want this to show, you can toggle it off and on in WooCommerce settings > advanced > WooCommerce.com. These are pulled in from the 400+ extensions in the WooCommerce marketplace and are typically for the DIY’er who needs guidance on what they might need vs. spending hours looking for the right feature. They will be found on your product page under the tab Get More Options. Each one can be dismissed by clicking on the X so you can narrow down what might be of interest to you. The fact that they are down here is better than being in some prominent area that might cause distraction. This way, users who find the feature useful will use as needed. There are a few distinct improvements that will speed up your site that are based on the Product Data Lookup Table. If you want to dig more into that, I would suggest you check out this post on their developer page. You can also learn about all the other small improvements and tweaks here. Although this is not part of core, simultaneously a new release of the Admin Dashboard is bringing more reporting and analytics to your dashboard. With it comes new Activity Panels and a customizable dashboard. You can see the post here on the latest release or get it on WordPress.org. Don’t forget, before updating always make sure you have backed up everything. Let’s face it, from top to bottom, your WooCommerce store, any kind of online store run on WordPress, needs to be maintained. But whatever you do in all this, don’t forget about your content. A couple of things had me thinking about content and how to maintain it. In a presentation recently at a local WordPress meetup, “How to Create a Content Strategy for Your WooCommerce Online Store,” I opened with the fact that store owners struggle with creating content. Their focus is on the store. Are orders being fulfilled efficiently? How are my conversions doing? For sure, these are things you need to be on top of. But the session was lightly attended because creating content is scary to contemplate and often, hard to keep up on, especially for small shops. If I mention blogging, podcasting, v-logging, whatever, I see concerned looks on their faces. So creating the content, let alone maintaining it, is a challenge. You need to have someone there to support you when things go sideways. You cannot afford to have your site down. Plugins breaking. This translates into money lost. So the focus on site maintenance is a natural. But What Does Content Maintenance Mean? Let’s say you churn out the content, whether it’s via written posts, videos, audio or a mix of all three. You occasionally update your content as your store and products grow, to reflect those changes. These are likely your product pages and some static content that needs to be changed. But as you add more and more content, things tend to build up. Then it’s time to plan maintenance for your whole site. When you create a mix of content, there are creative ways to extract additional content from your existing posts, videos, etc. Or the opposite. Maybe a short video or post will inspire something more in-depth. There are a lot of ways of doing this. Check out our post on repurposing your content to get more ideas. There may be posts wallowing on your blog that are pretty much worthless. If you were to go through your older stuff, you would probably agree. But with an online store there might be much more dated content that is crying to be removed. Maybe it’s something you can’t update. Maybe the product you were writing about has been discontinued. In any case, make sure you have your redirects in place and if you can redirect to another post or product, do it. When it comes to broken links, save yourself some time and use a plugin. Broken links can be both internal and external, both of which will make the customer’s experience less than positive. Dreaded 404 errors of pages that do not exist, are frustrating. Consider creating a custom 404 page that at least is more user-friendly. Also, use Google Webmaster Tools to help you keep track of those 404 errors. This is just one piece of the next SEO tip, but revisit your posts for internal linking. Yoast SEO calls it orphaned content. You know, those posts that have no incoming links for other posts on your site. Taking some time to revisit the content and find creative and useful ways to interconnect like-minded posts will do good things for your site. Google will get a better grip on who you are and what you are talking about. On your products, be careful to stick to the related products, cross-sells and up-sells to avoid destroying a potential conversion. The value of maintaining or repurposing your content is the impact it can have on your search engine optimization. Even little things, like fixing spelling errors or rewriting a sentence that didn’t make sense, can help your SEO and, in turn, your readership. Look at your product and post titles. Meta descriptions have grown and the Yoast SEO plugin reflects that change. Also, revisit keywords. The key here is not to mess with posts that already rank high when it comes to the meta and title. In the end, make your maintenance plan a two-parter. Have someone keep the tech side running for you and don’t forget to give your content some loving care, too. The post Weekly WordPress News: WooCommerce 3.6, 0-Day Vulnerabilities, and More appeared first on Learn WordPress with WPLift. WooCommerce is a popular platform for building and running an online store. It comes with a whole range of functions to run a business of any size. There are many extensions made especially for WooCommerce, either to add functionality or to carry out a specific unique task with WooCommerce. This article is the third part in the series of articles on WooCommerce extensions. To check out extensions dealing with product pricing, product display, and printing and invoicing, check out Part I. If you’re on the lookout for WooCommerce plugins to help with marketing, social media, and payments, head over to Part II. ShipStation is a plugin from WooThemes that helps to automate the shipping process. You will no longer need to manually print labels and weigh each package individually. The integration into shopping platforms is real time. You can import orders from WooCommerce with all the details of weight and product options. The plugin can include the preferred shipping method of the customer and any special instruction. With ShipStation, create the shipping label and post the details of the shipping carrier, the shipping status, and the tracking number back to WooCommerce. The customer can receive a standard or customized email when the product is shipped. This plugin is web based, so you can access the shipping function from anywhere. ShipStation is free for 30 days, after which you will have to subscribe to monthly subscription plans ranging from $25 to $125 per month. This plugin, WooCommerce Advanced Shipping, lives up to its name, offering a number of options in shipping products. It applies conditional logic using parameters, such as country, zip code, subtotals, quantity, weight, and size specifications. You can work out and apply your own shipping rates with suitable conditions and arrive at your own table. It is developer-friendly and customizable. Two extensions are available: Shipping Zones, which will help you create shipping zones based on area, zip code, and country, and Advanced Pricing, which will help you treat one whole group of countries as one, such as the European Union. Prices can be per product, per category, or per shipping class. If you want to insert a condition that isn’t there, get in touch with customer support. Purchase the plugin for $17 and be entitled to future updates and six months of support. You can get support for another six months for an additional $5.10. WooCommerce Weight Based Shipping is a WooCommerce extension for shipping that is based on, well, weight. With the integration of this plugin, potential customers can quickly calculate the shipping cost for their order. Of course, you can add several different rules that vary on different conditions which you preset in the configuration settings. No rocket science when setting up WooCommerce Weight Based Shipping for your online store. No doubt, even if you are a beginner, you can still get things going with the shipping based on weight. There are many valuable and convenient features that will help you set up the plugin according to your needs and requirements. Flexible price calculations, flat rates, exclusive free shipping and support for different shipping classes, WooCommerce Weight Based Shipping has all the necessary and more. Table Rate Shipping for WooCommerce adds a new shipping method directly to your WooCommerce settings. The plugin can categorize your destinations into various zones. You can charge additional fees for certain zones, and you can set the rates as fixed or variable. This plugin can apply multiple rates for deliveries based on conditions like destination, weight, price, volume, shipping class, and any special transport requirements. Separate levels of service can command different rates. For example, you can apply a different rate for express deliveries. With this No. 1 best-selling WooCommerce extension on CodeCanyon, compute the shipping rates inclusive or exclusive of tax. Rate bundling is also possible for customers who purchase many items. In addition, you can arrange the shipping option in the order you want and can set the default option. The plugin costs $22 and comes with six months of support and future updates. Support can be extended to 12 months for an additional $6.60. It would not be fair to call UltimateWoo a plugin. It is an entire suite of plugins that gives you access to a number of modules. All you have to do is install UltimateWoo and enable the extensions you need. To get an idea of what this plugin can do for you, just glance at the screenshot below. UltimateWoo also helps your shop to receive payments, analyze and report on various aspects, ship out orders, send out emails, and more. The 78 extensions included would cost you a cool $5,922 if purchased individually. You can choose to download the Lite version containing only 12 modules for free and receive limited support and updates. Or you can pick the Personal License for use on one WordPress website for $99, the Business License for use on five WordPress websites for $199, or the Developer License for use on an unlimited number of websites for $299. All premium licenses will receive regular support and one year of automatic updates. WooCommerce Amazon Affiliates converts your WooCommerce store into a powerful affiliate marketing enterprise, earning income by way of commission. With the Advanced Search and Bulk Import module, a store owner can search for and select products by category and subcategory. You can also choose variations of any product or select a price range. The ASIN Grabber helps to browse through products and then import it into your store in bulk with CSV Importer. You can automatically modify your content from Amazon. This means your products are in sync with Amazon products. You can use your Onsite Cart to collect products and checkout from Amazon. You can check out directly from Amazon, too. If a user is redirected to Amazon, the product will be added to your cart and kept there for 90 days. So, if purchase is postponed, you will still earn a commission from it. This plugin also allows cross-selling. This plugin can only be used as an addition to an existing or a new WooCommerce store. A user cannot set himself up to be a pure Amazon Store dealer. A regular license, which comes with six months of support and future updates, will cost $34. For an extra $10.20, the support will be extended to 12 months. Instead of sending out default invoices, you can now add a printable PDF version with this dedicated plugin. It also includes an option to create packing slips which you can download and print from the order admin page. A super convenient WooCommerce extension that saves you time, yet at the same time elevates your performance. Moreover, you will also find a PDF invoice template, but you can also create your own if necessary. It is fully customizable and easily brandable. With WooCommerce PDF Invoices & Packing Slips you can also sort out bulks orders with ease. On top of that, the plugin already comes in several different languages, like English, Finnish, Slovenian, Spanis and French to name a few. Of course, there is always an option to go premium and unlock even more features. When looking to build a multivendor marketplace, you can help yourself with WooCommerce Multivendor Marketplace plugin. This is a powerful and simple to use WooCommerce extension with a ton of features and functions that you can put into play out of the box. Speaking of which, WooCommerce Multivendor Marketplace comes with flexible commissions, reverse withdrawals, single product multivendor and zone and country-wise vendor shipping. It also supports multiple different payment methods, like Paypal, Stripe, Skill and bank transfers. Besides, it also supports custom payment gateways. Other sophisticated modules include store invoice, support ticket, shipment tracking and many more in between. In short, if your objective is to hammer out a multivendor marketplace, look no further and pick this striking WooCommerce extension. Make your lives simpler and take your project to a whole new degree. You can now add more information about an item with Custom Product Tabs for WooCommerce. This WooCommerce extension unlocks new tabs which allow you to include specifications, reviews, descriptions and loads more. You can add tabs on a per product basis, but you can also save the tabs and append them to multiple other items as well. These new tabs appear on the right side of the default description tab. What’s more, Custom Product Tabs for WooCommerce use WordPress’ text editor which can contain plain text, HTML, images and shortcodes. Moreover, the plugin is also compatible with WPML, so feel free to translate it to the language of your eCommerce website. When you would like to buy something but, for whatever reason, you can not proceed with the purchase at the moment, you add it to the wishlist so it does not go away. Later, you come back, see a bunch of other goodies you forgot you add and simply buy all of them. It is a big win for the business owner indeed. Well, you can now create a similar experience for your potential buyers on your online store. With WooCommerce Wishlist Plugin, you can help others start stuffing their wishlists and buy only when they can. Like mentioned earlier, there is a great chance that, instead of buying just the main product, they will purchase several other products that they – “unaware” – added to the wishlist. WooCommerce Wishlist Plugin ensures that the product immediately gets removed from the wishlist once added to the cart. Moreover, it allows you to customize the layout, utilize preset icons and even upload your custom buttons. Last but not least, your customers can also share their wishlist on social media platforms and via email. WC Marketplace is a free extension that promises to turn your store into a marketplace. For a visitor, it would be very much like walking into a virtual huge multistore marketing complex. You can allow users to sell anything on your site, much like Amazon, by registering as vendors on your site. WC Marketplace’ design is strictly according to WordPress coding standards, and all the documentations are available for download. As it is free, with extensions being added continuously, this is a great addition to your e-commerce store at no extra cost. With this plugin, approve vendors in bulk automatically or individually and manually. Manage them via bulk actions. Allow products to be uploaded automatically by vendor or only after manual approval. Set a threshold limit, product-wise or vendor-wise, for sales before commission is paid, and make a charge for the withdrawal of commission. You can make the payment through PayPal. WC Marketplace lets you edit the vendor page URL from your WordPress, and you can block vendors. You can link the product page to a vendor, and vendors can set shipping from the front end. Vendors can configure their own stores and export data in bulk. They can add or edit products and add coupons to products. Also, they can get immediate notification of new orders, view the back end, and withdraw their commission. Five premium add-ons make this plugin more attractive for vendors to register on your site. Vendors can view inventory reports, transactions, and sales from the front end. They can also view specific Google Analytics dates and set their own stock alerts. This plugin, developed by Dual Cube, has earned for itself an impressive five-star rating. Some more options that can help you to generally spruce up your WooCommerce are listed here. WooCommerce Store Exporter is for the reverse function of CSV Importer, exporting store details out of WooCommerce into files outside WooCommerce. It can export products by categories, variations, brands, tags, and much more. The premium version will also export to an email address and schedule regular exports. W3 Super Cache WordPress Plugin helps in the efficient use of server resources by serving up static files to users who are not logged in or to those who do not leave a comment on your site. This helps products load faster as outdated and obsolete files are cleaned. WooCommerce Customizer will help you to customize without having to use code. WooCommerce Multilingual enables fully multilingual sites. You can translate store pages and switch languages. WooCommerce Bookings is very useful when you want to sell your services by time (such as hotel rooms), when you want to allot a particular resource to a particular time slot (such as an instructor to a class), or when you want to offer appointments. With this extension, you can create booking slots and allot them on request. You can send email confirmations as soon as booking is completed. Then, you can send reminders closer to the dates booked. A booking calendar is handy so that you have an overview of how many slots are available and how many are booked. Customers can also view the slots that are available and make their pick. If you notice that some slots are not really a favorite with customers, you can offer a discount on them. You can give special rates and off-season rates as well. The plugin enables you to manage multiple products, too, for example, rooms in a hotel and seats on a bus for local tours. You can further set and alter the buffer period between bookings. If you combine this extension with product add-ons, you can offer extras on the booking. Note that only the website administrator can modify the bookings. The price for this plugin ranges from $249 to $449. Order Delivery Date for WooCommerce will allow you to offer a customer the option to pick any date for the delivery of their purchases. It uses the datepicker that is inbuilt in WordPress. This plugin will reduce the chances of the delivery person finding a locked door when he goes to deliver and save a second trip. You can display the possible delivery dates you want and allow the buyer to pick a date. You can exclude days like Sundays or any special holidays. The date picked by the buyer will show up when you view the order, so you can take note of the specific instruction for delivery. The premium version of this plugin will allow you to customize the calendar and allow cutoffs for the same-day and next-day deliveries. You can include the delivery date in a custom email. Further, the calendar can display two months, and the time range for the delivery can be shown. WooCommerce My Account Widget provides a lot of information about your customers in your WooCommerce shop. See the number of items in the shopping cart and the number of incomplete orders. The plugin also displays the unpaid orders and the link to the shopping cart. It is compatible with WPML and is available in over five languages. WooCommerce Memberships helps you sell memberships. Restrict access to content, and distribute content to members according to a set schedule. Create many types of membership plans, and attach different perks, privileges, and access for each. The extension costs $149. Create, manage, and sell gift certificates through WooCommerce Gift Cards. Accept payments through regular payment gateways. WooCommerce Product Enquiry for WooCommerce lets you ask questions right from the products page. You can turn a visitor into a buyer. Checkout Field Editor lets you add custom fields on the checkout page. Edit existing fields, or remove them altogether. You can also add text, datepickers, and checkboxes. Purchase this extension for $149. 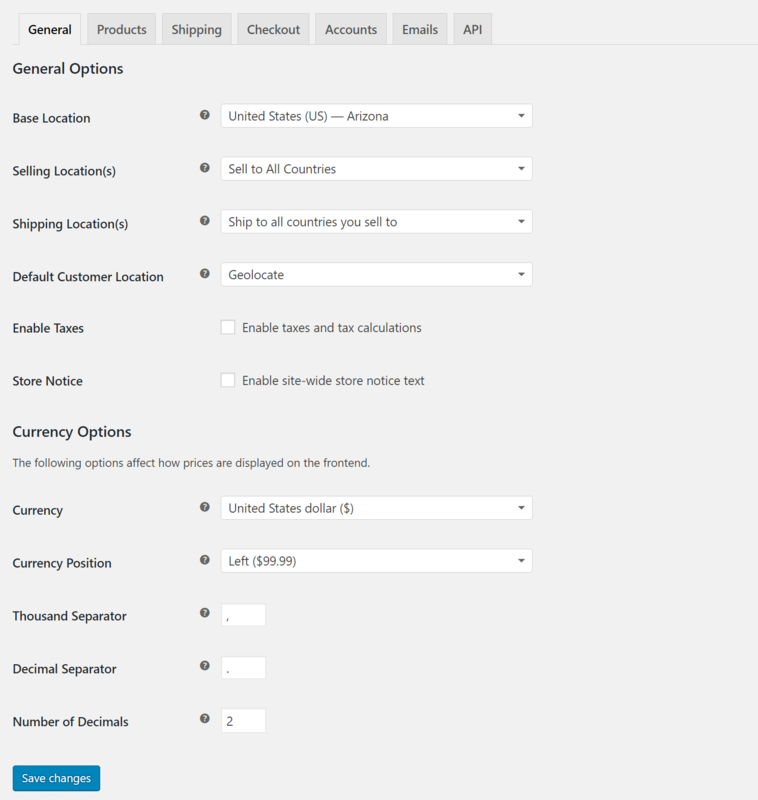 WooCommerce Currency Switcher helps you convert one currency to another in real time. It is available both as a shortcode and as a widget. The customer can pay in the selected currency. The premium version will convert the currency automatically based on the customer’s IP geolocation. WooCommerce Checkout for Digital Goods is for selling digital products. It is easy to install and skip all the unnecessary fields, like addresses and phone numbers. Purchase this plugin for $7. This list concludes my three-part series on useful extensions that add functions to your WooCommerce store. If you have found any plugins that are particularly useful, please share them with us. In case you haven’t decided on your WordPress theme with WooCommerce integration, you might want to read this article to find the best examples. If you want free themes, the best place for research is here. WordPress, without a doubt, is the most popular blogging platform, as it powers nearly 20% of all the websites today. The number of new WordPress websites being created are continuously growing each day. WordPress is an open source solution, and there are thousands of developers contributing to this great platform. As a result, millions of different themes and plugins are available for it. This number is only continuously growing by the minute. The best part is that most of them are free, including the some of the most useful ones, such as WooCommerce. This plugin allows you to build and launch your own eStore with utmost ease, without doing any of the coding. Just upload your product images and you are ready to go! WooCommerce is downloaded over 7 million times from WordPress plugin repository alone. If you are not yet familiar with WooCommerce, you can read more about it on WordPress.org or on its author’s website, WooThemes. There are plenty of amazing WooCommerce themes available, but not all of them are free. However, the open source community is huge and some developers have created free WooCommerce-optimized themes. Everyone deserves to get paid for their work, so if you are downloading any of these free WooCommerce themes, consider donating to its original authors. We also have similar theme collections that are dedicated to premium WooCommerce and other eCommerce WordPress themes. You can find the WooCommerce theme collection here and the eCommerce theme collection here. We are living in one of those rare historical moments, when a game-changing factor promises to expand our understanding about the business world. Just like the explorers from a few centuries ago, today’s internet entrepreneurs can operate in a meritocratic, unregulated environment. While monopolies slowly creep on every field in the real world, the virtual space can still create overnight millionaires. If you have a good idea, you can take it online. Shapely is a WordPress theme that embodies that spirit of innovation, and it can help you to construct an impressive commercial site. This is made possible by WooCommerce, one of the most popular and sought-after WordPress plugins. As a business owner, you can charge people for anything that peaks their interest: books, movies, memorabilia, hand-crafted ornaments, and so on. As long as you have a good product or service, Shapely can help you to sell it. Users will be able to modify every option, and tweak any setting. With ease, you can edit footer text, change color palettes, or upload hero images. For more information regarding this theme and its incredible features, be sure to consult the free documentation source, or the free content demo. Illdy is a truly powerful and endlessly flexible theme, equipped with a set of diverse, powerhouse plugins, features, tools, widgets, shortcodes, templates and layouts that can make short work of absolutely any website design, construction and maintenance needs you could possibly encounter. This theme’s focus is on performance, reliability and ease of use. Thus, Illdy makes for a solid choice for corporations and corporate webmasters that want an inexpensive solution to their corporate website needs. Illdy can also service the need to present services, products, staff and or workgroup teams, professional portfolios and related information crucial to success in the online market. Furthermore, Illdy includes a plethora of convenient and business friendly page templates and shortcodes as specific and time-saving as Pricing Plans or Staff blurbs, with a myriad options for visual configuration, handsome one page website capacities, top of the line smooth Parallax scrolling and more, so that from day one, you have everything you need to make it in the web with your corporate website! Try Illdy now! Tyche is a free WordPress theme specializing on shops and sales. It is a simple, clean and focused Colorlib product. It comes with support, documentation and WooCommerce compatibility. Tyche also features an ad banner and different sections like Trending and Most Wanted. It even has an intuitive menu with a top bar and a footer to increase elegance and accessibility. Tyche is a well-crafted theme with partial orientation to female crowds and clothes shopping. It also offers free shipping systems, shopping carts, search bars and a login account. It even includes blog pages to set! Try this awesome easy going theme and get your business going! Try Tyche! Ascendant is a multipurpose WordPress theme available to download in free version and to buy in two other different ones. It includes a demo and many other great features. Ascendant is easy to use and can be an awesome start for any personal webpage or business project. You will get WooCommerce compatibility for transactional matters. As for layout design, unlimited colors, posting pages and customizable headers are featured too. Ascendant gives you +100 super cool Google Fonts to write your posts. It also provides and all screens and cross-browsers compatibility. Have fun and get your set up with this simple intuitive tool. Use Ascendant! Activello is an extremely pliable theme that has been thoughtfully equipped with a slew of purposeful and convenient tools, features, plugins, templates, layouts and widgets. This enable you to effortlessly create endless amounts of custom, unique websites for all sorts of imaginable purposes. This theme is a naturally strong fit for business websites of all kinds, from professional agencies to small family businesses, from restaurants to legal services. If you are trying to establish an online presence and expand through new and attractive markets, Activello is the theme for you. With tons of useful shortcodes and widgets available, you surely can’t go wrong with it. Activello also includes tons of dedicated inner pages readymade, waiting for your content, color schemes and style choices. Activello is minimalist and elegant, and it is bound to improve your business in no time at all. Lastly, the theme is optimized to work with WooCommerce ecommerce platform for WordPress. Sparkling has been packed to the brim with an ample set of page templates, tools and features. This empowers webmasters of any skill level to create amazing websites in a matter of minutes, without having to write a single line of code. And with outstanding features like the FlexSlider-powered Featured Slider, a modern and flat graphical design employs a visual language intuitive to users across a wide demographical range. Gorgeous Jetpack Infinite Scroll technologies allow for dynamic content loading without impacting page load times. Sparkling has been completely integrated with the powerful WooCommerce plugin. It also features a wealth of WooCommerce-ready shop pages, product portfolio demo pages and convenient shop or commercial options and shortcodes that will save you time and look impressive, right at your fingertips. Lastly, Sparkling includes thorough documentation and extensive support, so you can be sure your WooCommerce website will always be in tip-top shape. Start Sparkling today! Allegiant has been developed for webmasters to effortlessly put together highly functional websites across a huge range of interests and applications. From business and commerce to personal and professional websites, Allegiant can tackle them all. Allegiant’s core features include a resourceful layout customization interface that empowers you to fine-tune your headers and footers, deploy shortcodes upon your sidebars and sections. Impressive commercial capabilities powered by the WooCommerce eCommerce plugin suite makes setting up your own online shops an easy, breezy matter. Combined with seamless portfolio customization and layout settings that allow you to showcase your product catalogues to the world, Allegiant is a perfect theme for marketing products, wares and services of any kind to a broad online audience. Allegiant is a natural salesman, and its SEO enhanced coding makes it a top performer in search engines, netting you more traffic, more ad revenue and more sales overnight. Based on a modular Bootstrap design, Allegiant is natively responsive, cross-compatible with browsers, devices and platforms the world over. Check out Allegiant today, and see for yourself! Affluent has been purposefully crafted as a robust framework for the uncomplicated and speedy development of eloquent, functional websites across all sorts of applications and website archetypes regardless of your previous experience or skill level. Featuring powerful layout customization controls, Affluent lets you fine-tune every page and element within your websites in a matter of minutes, without having to write a line of code yourself. With Affluent at your side, you’ll have a professional quality website up and running in no time at all. And with its potent integration of the WooCommerce eCommerce plugin suite, Affluent is a capable salesman that can effectively market your wares to the world at large with incomparable ease and an intuitive end-user visual interface that makes your visitors feel at ease as they explore your product catalogue, add ítems to their shopping carts and make purchases, right off your very own website. Try Affluent today! Travelify was built with nature in mind, so it would be an ideal fit for eStores for green, natural, healthy and ecological products. However, there is no sign that you can’t use this theme for any kind of products. Travelify also features the simple yet powerful Theme Options for slider, logo, theme layout, and social network icons. This theme also has various page layouts and other great tools to build your own WooCommerce website. This theme, while free, comes with incredible support from theme developer and well written documentation. Travelify is translatable into several languages including German, French, Hungarian, Dutch and Chinese. Brilliance has been created by a team of developers and designers aiming to furnish webmasters with an ample set of options and customization tools that put you in charge of every element of your website’s look and feel without having to know a thing about coding to achieve sophisticated, professional results filled with resourceful functionality. Well-suited for both business and commercial applications, Brilliance combines extensive portfolio showcase capabilities with amazing commercial functionality. These are powered by the industry-standard WooCommerce eCommerce plugin suite, which underpins a range of impressive features such as online shop page templates, powerful shopping cart systems complete with checkout and payment method management, and much more under the hood. With excellent capacity for product catalogue showcasing, and a particular skill for increasing your conversion rates, Brilliance is a theme that can definitely impact your bottom line and increase your revenue quickly and effectively. Mobile friendly and responsive, Brilliance has strong Bootstrap roots that empower its utter cross-compatible performance in devices and browsers around the globe. Market your wares to the world at large, with Brilliance, today! Transcend performs at a high level across multiple different applications in numerous industries and businesses. Uniquely intuitive in its website design and customization process, Transcend requires nothing but a few clicks for you to handcraft the look and feel of your every page, from layout design to individual element customization settings, functional sidebars, smoothly animated headers and feature-rich footers, among many more capabilities under the hood. With advanced technologies including HTML5 coding, CSS3 dynamic stylesheet scripting and sophisticated AJAX powered categories and tags that effortlessly organize your content for your audience to make their way about it without writing a line of code. Transcend is completely integrated with the industry standard WooCommerce eCommerce plugin suite, which empowers its built in online shop page templates, resourceful product catalogues and product detail pages, functional shopping carts and checkout pages and many more essential commercial features that let your users become your customers without a hassle. Responsive and mobile friendly, Transcend adapts itself to render your content seamlessly on any platform or device. Try Transcend now! Zelle Lite (formerly Zerif Lite) is a clean and modern one-page WordPress theme best for digital agencies, studios, business, product showcase, portfolio and other awesome websites. This theme is built on Bootstrap 3 frontend framework which makes it fully responsive and well optimized for tablets, smartphones and other devices. Zerif Lite is SEO friendly that will help you to to sell your goods listed on your eStore. This theme is the right choice if you are looking for one page WordPress theme that can also be used with WooCommerce to build awesome estore. FlatOn is an impressive WordPress theme that can improve any website. It is based on a beautiful flat design, adding a layer of charm to your pages. This theme is also streamlined and modern, guaranteeing that your website will outshine its competitors. Moreover, scaling and resizing issues can cause some sites to experience a reduction in viewership, as mobile users cannot access content. With FlatOn, those issues are a thing of the past because this theme is entirely responsive. Desktop computers, laptops and tablets can display your content with ease. As a business owner, the full responsiveness will allow you to update your content while on the move. Two simple color palettes are also available, providing some variety in terms of aesthetic design. Additionally, FlatOn has a skeleton framework for its grids, and a minimal CSS. SASS is used for the production of Stylesheets. This theme is also highly versatile, as it is able to fil any content niche. However, its primary purpose is to enhance business websites. Online attention spans are notoriously brief, and you only have a few seconds in order to impress your clients. FlatOn’s high standards and consistent quality will aid in any business venture. There is a free theme demo available for those who wish to sample the content. Catch Flames is a clean, streamlined full-width WordPress theme. It is entirely responsive, assuring that all visitors will get to enjoy the same quality experience, regardless of what device they are using. Catch Flames makes the most out of your screen space. It just feels bigger, wider and more luxurious! The default layout uses a three column design, but users can easily change it to a single or dual column setting. You know what’s best for your page, and this theme lets you create something that resembles your vision. This product is considered the spiritual successor of another amazing theme: Catch Box. Also, its construction was influenced by user requirements and recommendations. Catch Flames uses the latest CSS3 and HTML5, and it also includes a user friendly Theme Options panel. It requires no specialized knowledge or preparation, given that the layout is highly intuitive. Furthermore, all of these features can aid in the creation of a truly amazing website. If you want to establish a personal online shop, this is the theme for you. The WooCommerce plugin was incorporated, assuring that you can safely commercialize your products. Catch Flames can be translated into several languages, given its multilingual capabilities. As its name suggests, this theme is based on a mobile first design philosophy. Recently, the market for mobile devices has grown exponentially, forcing many sites to adapt their layouts for smaller screens and touch interactivity. This theme is completely responsive, guaranteeing that all users will benefit from the same quality experience. It also accommodates all screen sizes and resolutions. Moreover, Responsive Mobile has incorporated 11 Widget Areas, 9 Page Templates, 6 Layouts for Templates and 4 Menu positions. The intuitive Theme Options can be navigated by anyone, regardless of their level of expertise. They also allow for full CMS control, and the ability to upload your own personalized logo. You may even integrate Social Networking into your marketing strategy. In order to increase revenue and brand awareness, the WooCommerce plugin was integrated. It also allows for the creation of an impressive online store, offering your visitors a safe and reliable platform for their purchases. Appealing to a foreign audience will expand your view count, and help you to climb search engine rankings. However, this cannot be achieved without multilingual support. Thankfully, this theme can be translated into many languages, and it also supports RTL (right to left) writing for languages such as Japanese or Hebrew. This is truly one of the best WordPress themes. It has earned a 5 out of 5 star rating, and it was downloaded over 133,000 times! Its design is sleek and responsive, offering 3 templates for your pages, and 10 social icons. There is a Full width page variation, a Left sidebar page, and a Blog page template. You can tailor your site logo, and tweak it until it is just right, with over 600 Google Fonts available for use. Asteria Lite also includes a wonderful Gallery feature, a maintenance mode feature, a custom CSS feature, and a feature for export/import. In addition, it supports the Contact Form 7 plugin. WooComerce integration allows for the creation of an amazing online store. Commercializing your goods will definitely increase your bottom line, and promote brand awareness. Say goodbye to downtime as you browse, because the Ajax pagination feature allows you to navigate through posts without a site refresh. This theme has a plethora of user-friendly options, making it accessible to everyone. It is great for both experts and newbies. Asteria Lite features search engine optimization, to ensure that more people will find your page, thus increasing your view count. If you are on a tight budget, yet you still want to open a successful online store, Seller is the right choice. This WordPress theme is compatible with the innovative WooCommerce plugin, one of the most trusted names in the industry. It will make your site look professional and clean, proving to your potential customers that you know what you are doing. There are a great number of features available, as Seller was designed to maximize the owner’s chances of getting noticed. Despite the fact that this theme is intended for online commerce pages, it can still be used for other sites. It includes a Professional Slider, a Showcase Area, several Page Layouts, Footer Widgets and so on. It incorporates a Left and Right sidebar, featured images, and threaded comment sections. If you prefer the convenience of your mobile device, Seller can accommodate your taste. Tablet and smart phone users will benefit from the same quality experience as those who use laptops or desktop computers. In addition, admins can manage and update their sites without being tied to a desk all day. Currently, this theme was downloaded over 30,000 times, and it has received a 4.5 out of 5 star score. Sale Junction is a versatile ecommerce store WordPress theme from Ink Themes. This premium theme is compatible with both the WooCommerce and Easy Digital Downloads ecommerce plugins, which makes it possible for you to sell both physical good as well as digital products. The theme has a custom homepage with a featured slider and options to display multiple categories of products. This theme comes with a shopping cart, a floating info bar the top of site provides a quick link to your cart and account pages, 7 colorschemes, customizable colors and styles, various page templates, numerous widgetized areas and more. If you are a fan of simple and clean website template with mint green accent colors, then you should go for RestImpo. RestImpo is a minimalist free theme perfect for creating business websites. This theme is fully responsive and offers an array of theme options. RestImpo theme comes with 3 pre-defined color schemes, 220 Google fonts, an intuitive Theme Options Panel for fast and easy theme customization, custom widgets for displaying the latest posts from the selected category, custom shortcodes, 2 menu areas, adorable social networking icons, theme documentation and much more. Virtue is an extremely versatile WordPress theme built using Bootstrap front-end framework. The developers optimized this theme for mobile devices such as tablets and smartphones with the help of Bootstrap. This theme packs various premium style features that you can access via Theme Options. There is literally nothing you can’t do with this theme. Virtue is WooCommerce ready, so you can create your own modern looking eStore. This theme easy to customize thanks to several homepage layouts, image slider, portfolio pages and and other awesome features. You can bring your product closer to your audience thanks to translation-ready setup. Just look at theme demo to see how amazing this theme is. Vantage is a clean modern looking WordPress theme optimized to be used with WooCommerce toolkit. Theme developers claim that this is the best and the most revolutionary theme they have ever built. They have also optimized Vantage to work with Page Builder. This theme also has featured image sliders to showcase your the most important content. They integrated this theme with FontAwesome fonts, so you can easily access all the incredible looking icons. This is my favorite theme in this collection. I really recommend this theme for anyone who is looking to build their own WordPress powered eStore. Haven’t looked into theme code but this still is one of the best choices and the main thing is that it’s free theme unless you are looking for enhanced functionality which is available in premium version. This is by far the most popular theme on WordPress, having been downloaded more than a million times — and is continuously being downloaded. In addition, its clean and fully responsive design will please most users. Moreover, the well-rounded Theme Options are everything you will ever need. If I would have to choose between all these free WooCommerce themes, I would take this one, mainly because of its clean code. However, you must also consider redesigning to make it look more modern and bright. Furthermore, some flat design guidelines would make it the best theme around. Klasik Framework is a minimalistic and a starter theme for further development. It is a perfect fit for developers and can be used as-is and it will still look spectacular. Moreover, all the custom functions like WooCommerce integration, translations, responsiveness are already there. Just upload your product images and you will get the cleanest looking WooCommerce store you have always dreamed of. Like most modern themes, Klasik Framework is also SEO friendly and responsive. It has been built it using the latest web standards such as HTML5 and CSS3. Here goes all free WooCommerce WordPress themes I was able to find today. Although you must know that there are many other free themes out there, waiting to be discovered. If you are developer and you feel that your theme is missing from this list, please leave a comment below. I will add your theme for free. When it comes to selling goods online, every marketer should be familiar with the know-how of latest trends and techniques so as to be a part of the ever-changing wave of evolution. By understanding what exactly your customers are looking for, you’ll get all the essential tools and information that will help you know how to set up WooCommerce and other marketing strategies. Considering how modern-age buyers are solely relying upon online shopping, according to an estimate, an approximate of 95% purchases are going to happen online by 2040. With this, the online world is definitely opening up a lot of opportunities for sellers as well as buyers. In such a scenario, having a WooCommerce online store can be of great help. If you’re thinking to go for the same, this post will help you from scratch. Read on and know more about WooCommerce and how you can set it up on your own. Launched in 2011, it’s a free WordPress plugin that works to add e-commerce functionality to your website; thus, helping you build an online store on WordPress. Just within a few clicks, you can transform your site into a completely functional e-commerce store. With more than 27,000,000 downloads as well as 4 million+ active installs, this plugin is undoubtedly a driving force behind innumerable online stores. This plugin would be a perfect choice for those who’re looking forward to selling products online at an affordable price. Right from selling physical and digital products to managing the inventory, taking care of shopping, securing payment, and sorting out taxes automatically, WooCommerce helps you accomplish almost every necessary task. Along with the limitless potential to scale the online store, this responsive plugin also allows you to take 100% control over the data. By far, WooCommerce is considered the most popular and considerable solution for e-commerce, powering 42% of the worldwide online stores. How to Set Up WooCommerce? Whether you’re are a newbie or a professional, this step-by-step guide of how to install WooCommerce will help you begin your journey effortlessly. First and foremost, you’d have to install the WooCommerce plugin. You can either do so from the WordPress repository or from within the dashboard. If you wish to install it from the dashboard, navigate to WordPress Admin > Plugins > Add New. Once here, search for WooCommerce and click Install Now. Make sure that you’re installing nothing but the latest version of it. 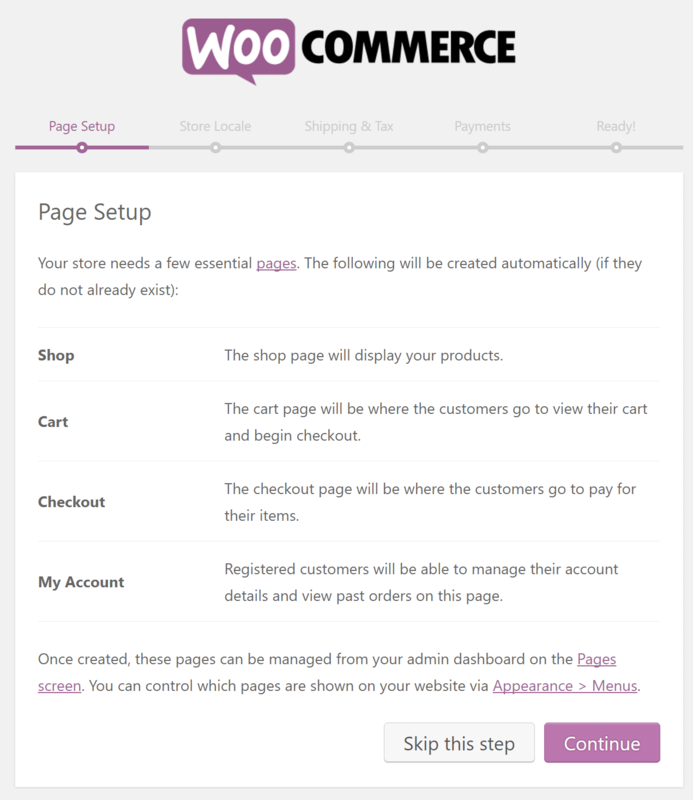 On the page set up the screen, WooCommerce would be notifying you to create specific pages automatically to complete the setup. This would include cart, shop, checkout, as well as my account pages. Click on Continue to create these pages. 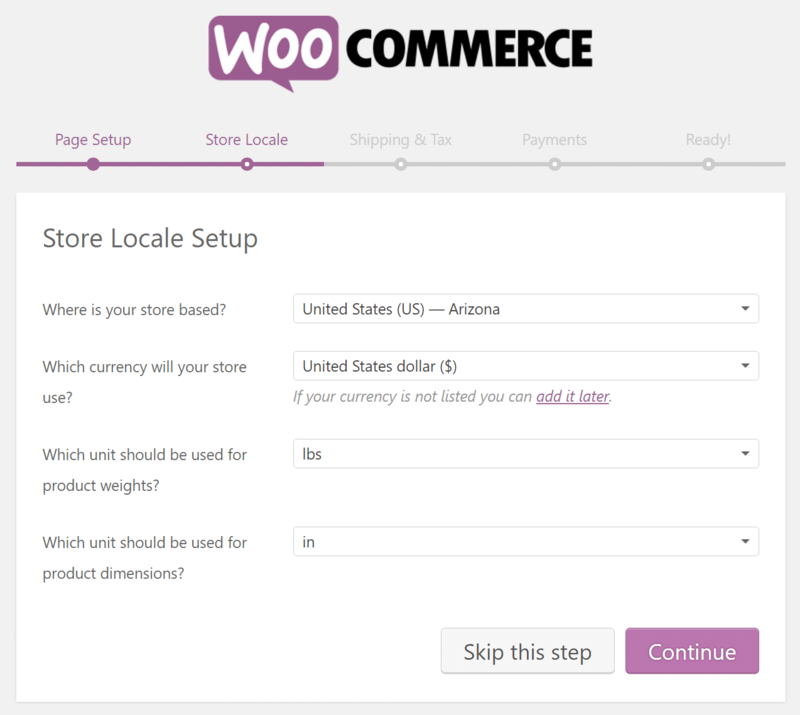 On the screen of store locale setup, WooCommerce lets you quickly select the country and or state, the currency, and product units. After filling this information, click Continue. One thing that you must remember is that WooCommerce can also be used to sell downloads and digital products. Therefore, on the shipping & tax screen, you can select whether you’re shipping physical products to consumers or not. And then, you can also enable sales tax as per the requirement. Once done, click Continue. On the payments set up page, you can select the 3rd party payment processor that you wish to integrate on your online store. And then, click Continue. That’s pretty much it. Now, your WooCommerce store is completely ready. To return to the WordPress dashboard, click on the link available at the bottom and you can start creating product pages. WooCommerce comprises a variety of shortcodes that you can use when it comes to adding products and relevant content to posts and pages. Generally, these are small text that can be inserted anywhere effortlessly. With these shortcodes, you can incite function to add content. Moreover, WooCommerce shortcodes can also be used to add user account data, order tracking information, edit user accounts, show individual products, show recently featured products, and change password information. WordPress as well as WooCommerce, both are exceptionally easy to use. Merely in ten minutes or less than that, you can install and run your WooCommerce store. In fact, even if you’re completely unaware of the process, you wouldn’t take much time to make the store function. Not just the installation and setup, however, adding products and managing other aspects of it is as simple as a cakewalk. Mostly everything in WooCommerce works the way you’d expect. One of the most common problems that people come across while choosing a platform is the flexibility in terms of functionality and design according to the requirements and wishes of a user. In contrast to all the limited and proprietary platforms, WooCommerce turns out to be a flexible one. You get to regulate the features and functions of your online store completely. Whether it’s about altering the style or customizing the page layout or displaying the store on different devices with a small screen and lesser resolution, WooCommerce takes care of everything for you. And then, there is a variety of themes available out there, specifically meant to enhance the appearance of your store. WooCommerce also allows you the opportunity to extend the functionality of your store, thanks to the myriad of plugins available out there. These thousands of plugins can help you accomplish goals and achieve tasks just within a matter of time. Be it keeping the store updated, taking a daily backup, making search engine optimization up-to-the-mark, or installing Google Analytics; you can do almost everything with these plugins. WooCommerce comprises a variety of significant options that allow you to add new coupons to your online store. 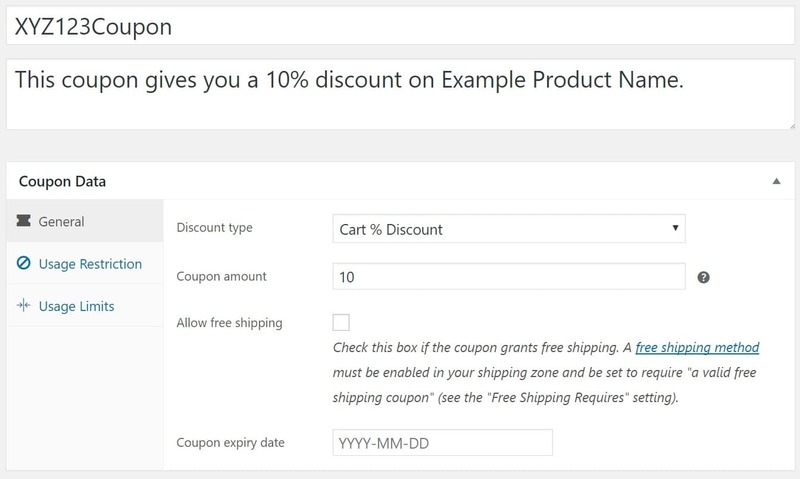 In the coupon editing section, the widget lets you customize the discount as well as restrictions. The General tab lets you edit the basic information regarding the coupon, such as the type, cart discount, product discount, cart percentage, product percentage, free shopping options, value, expiry date, and coupon taxation. In the Usage Restriction tab, you can set up the minimum purchase that a customer would have to make to use the coupon. Here, you can also select the product and categories on which the couple applies. And then, you can also ban email addresses from using the coupon. In the last Usage Limits tab, you can set the limit per customer or per coupon. Here’s the section where you can impressively customize almost every part of your WooCommerce. Right from the checkout process to email options, you can tailor everything as per your satisfaction. In the General tab, you can take care of the necessary information, like display options, base and selling locations, and the currency. When it comes to product data, such as default displays, custom sorting, product thumbnail dimensions, measuring systems, download methods, and add to cart buttons can be easily altered in the Products tab. In the Taxes tab, you can alter the taxation methods. If you don’t wish to get into taxes yet, you can also disable this option. In the Shipping area, you can pay attention to the pricing models and shipping methods. You can also enable or disable the shipping store-wide and edit different display options. Here, you can also restrict the availability of your store to certain countries. Checkout area lets you customize the process of checkout. Here, you can edit the pages, select the one from five different payment gateways, add a Terms & Conditions page, and change the URL additions. There’s no denying the fact that a simplified checkout process can help you increase the conversion rate to a great extent. By providing a seamless experience to your buyers, you can ensure their respective return to your online store. With this plugin, you can get rid of the unnecessary checkout procedure that may seem like a hassle to your customers. By making the process simpler, this plugin removes the need to visit the shopping cart just to check out. Instead, it lets your customers check out from the product page itself. When running a new WooCommerce store, the necessity to retain customers cannot be taken for granted. And then, accordingly, it’s far more tiring to maintain a customer in comparison with obtaining a new one. Although there are several techniques and ways that you can use to make your existing customers stay, however, one of the essential methods would be sending out constant reminders of your existence. To help you with this task, WooCommerce MailChimp plugin is here. With this tool, you can seamlessly integrate MailChimp to your WooCommerce store. And then, you can collect and store the email addresses of those visiting your store or purchasing something from it. Also, with this specific plugin, you can either create a form for your users that they can fill out or automatically add their data to your mailing list. This one is yet another significant WooCommerce extension that can considerably enhance the user experience, leading to a satisfactory conversion rate. Upon arrival, customers would wish to see products they’re desperately looking for, without wandering much on the store. With this plugin, you can filter out the products and display the required ones. It allows you to select between list or drop down, colours, labels, and showcase only certain products that’d suit your customers’ requirements. If you’re opening global doors for your online store, one thing that you must keep in mind is that customers from across the world are going to visit the site. In such a situation, you’d have to ensure that the WooCommerce for WordPress site supports multilingual functionality. WooCommerce Multilingual is one of the best plugins that can help you with the same. It helps to translate products and to keep the same language throughout the pages available on the store, including the checkout process. If you want, you can also send emails to admins and clients in a specific language. Having a WooCommerce store calls for adding several attractive elements so as to keep the customers attracted and hooked. Out of all the things that you can use, the slider is an element that lets you display your latest products strikingly. Therefore, with SlideDeck, you can do so much more than the imagination. It allows you to create a variety of sliders that you can showcase on your homepage or landing page. And then, to match your requirements, you can also customize the slider the way you’d want. The best thing about this plugin is the responsiveness. Thus, your slider will be visible to all of your customers, irrespective of the device they’d be using. Understanding how to set up a WooCommerce store can work in your favour would be beneficial enough to help you obtain several accomplishments. With this platform, not just you can create a fantastic store for your brand but can also provide a seamless shopping experience to your target audience. And then, unlike other platforms, it doesn’t come with any restrictions either. Even if you don’t have physical products but digital, WooCommerce stands by you to help you achieve business goals. Along with the flexibility, it’s ease of use is something that makes it a considerable platform. So, if you’re wondering about having a store on your own, sign up for WooCommerce today. All you’d require is a hosting company and a domain name. Other than that, follow this guide and complete the setup procedure today. In the current social media obsessed environment, when you look out for ways that can help you increase conversion rate, you wouldn’t be dissatisfied with the result that you’re going to get. All you’d need to do is target the right set of audience on correct platform. Although everything might seem fascinating, however, the real challenge would start once you’ve started receiving an adequate number of visitors on your WooCommerce store. And, from there, you’d have to compel your visitors rightly so that they’d purchase some or the other thing from your store. Having said that, here are the top 5 considerable tips that you can apply so as to skyrocket your conversion rate. Have a read! If you’ve dived deeper into the behavior of your customer, you’d understand how impatient they generally are. Moreover, if your target audience also includes youngsters, creating a sense of urgency is going to help you achieve better results. When it comes to this, there are several ways to execute this idea. First of all, you can showcase the number of products left in your stock. While going through products, there are chances that your customers might leave the purchase on next day or delay it because of certain reasons. However, if you show the In Stock number, they might want to complete the purchase without missing it whatsoever. Secondly, you can also come up with a particular offer or deal and tell your customers that it’s available for a certain period of time. Nobody would want to leave a significant product and that too when it’s available at a lower price. For those who don’t seem to find an answer for how to increase conversion rate, paying attention to this aspect is quite crucial. The call-to-action, also known as CTA buttons, are the ones you’d want your visitors to click as soon as they land upon your website. Although you’d have displayed these buttons on every other page, right from the product page to the checkout, it’s the position and alignment that you shouldn’t take for granted. The Placement: A CTA button must be placed at the top of the page so that it’d attract your visitors instantly. Shape & Color: In comparison with other content, make sure you’re making CTAs different and attractive. So, select the right shape and colors. You can also use pictograms as well as bright colors to differentiate these elements. The Text: While writing down text for CTA buttons, try and neglect aggressive verbs as much as you can. You must not let the visitor realize that you’re forcing them to take an action. It might make them run away. At the end, ensure what you’ve settled down for is proficient enough to help you obtain results. According to an estimation, just more than two-thirds of carts are abandoned on every WooCommerce store. Especially, your visitors tend to abandon the basket before finalizing their order. They may add relevant products to their cart or may even fill out the checkout form but never complete the purchase. If you manage to decrease this dropout percentage, you can surely see a positive impression on your conversion rate. So, how can you re-engage those who’ve abandoned the cart? You can easily do so by intelligently pushing the abandoners towards completing their purchase and availing the best of your products or services. You’d have two significant options, you can either send them an email or call them. Of course, it can only be done if they’ve left their data behind. Generally, calling abandoners turns out to be more time consuming and intrusive. So, you can avoid it if you can and make use of emails to get in touch with your customers. You can send them a reminder for completing the purchase. Or, you can also email them regarding the latest offer running over the products lying in their cart. If not, you can also tell them how soon their cart products are going to be out of stock. The more transparent you’re being with your target audience, the better they’ll be able to trust you. And, it’ll not just help you increase the conversion rate but establish significant credibility among users as well. Therefore, when it comes to mentioning product specifications, you need not to hide anything from your customers. Keep in mind, your one mistake can push you into the dig of loss. In terms of both good and bad services, your customers tend to influence other leads through word-of-mouth. In such a situation, if you’ve mentioned something on your product page and you fail to provide the exact same thing to the customer, one bad review might ruin your brand’s reputation. Thus, make sure you’re being as cautious as you can here. Structure the product descriptions in such a manner that you seem to prioritize the information. Tell your customers about the features of your products. But, you must also talk about their benefits. 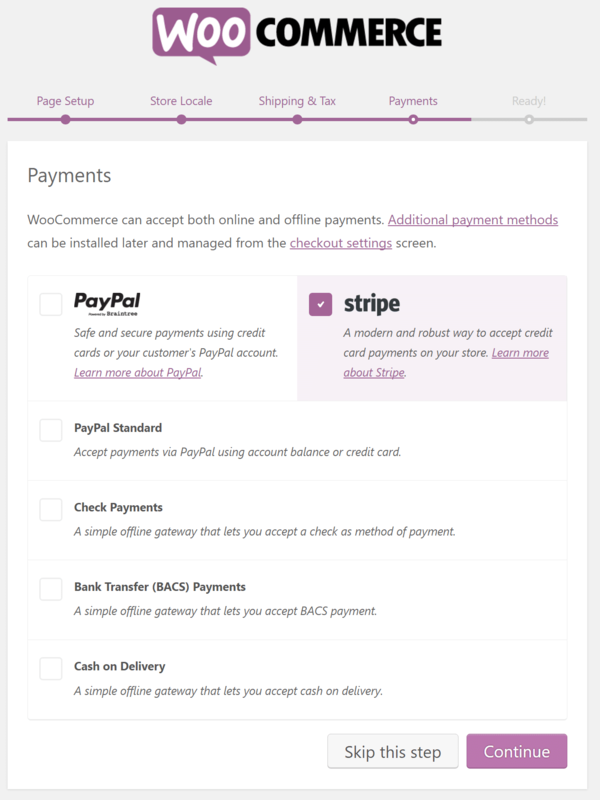 On a WooCommerce store, a checkout process is a journey that visitors complete until the very last step of payment. Upon observing, it’s been noted that the shorter the process of checkout, the more likely a visitor will end up purchasing a product. Thus, to enhance your conversion rate optimization, you must cut short your checkout process. Generally, it’s also not advised to compel visitors to create an account so as to complete their purchase. This practice can leave a negative impact on your overall conversion rate. There’s a majority of users who don’t wish to create an account and they give up on your website if they’re forced to do so. You must always leave the choice upon your users. Also, avoid asking a lot of personal information from users. You must only ask what’s necessary, such as full name, email address, bank details, delivery address, and more. To upstream the process, provide a smooth navigation system. Make it easier for customers to access different products without experiencing much hassle. The conversion rate is one such essential factor that lets a WooCommerce store to enhance the turnover with the help of digital marketing. Of course, conversion is what provides the ability to obtain more customers and increase the flow of income. Therefore, having a high conversion rate is crucial for the survival of any online store. With these best practices, you can optimize your WooCommerce website and seamlessly skyrocket the sales. So, start implementing them today, without any further ado. If you know about any additional tips and techniques that can help increase website conversion rate, don’t forget to share with us in the comments section below.